Jane placed as a finalist in the 2017 Script Pipeline First Look Project with her short film (and series pilot episode) The Parker Tribe, an introspective, autobiographical dramedy. She’s currently writing for both film and TV. You were a finalist in the Script Pipeline First Look Project with your short film The Parker Tribe, which also doubles as essentially the first episode of a dramedy series you’re shopping. The story itself is personal, correct? What compelled you to bring this one to life? I’ve been writing about my life since 2002 when my mother passed away. I realized that I knew very little about my mother before we seven kids came along. Having two boys myself, I was damned if I was going to leave them without a backstory on their mom. So I began writing about all the things that happened in my childhood that people thought bizarre or hard to believe. In writing more and more, I realized that maybe people did have reason to question because on the surface it does seem like a lot for one family. I got busy with life and the writing fell to the side for a bit. In 2005, my eldest son was diagnosed with Hodgkin’s Lymphoma, and I returned to writing this time more to keep my sanity. My sons have always liked hearing about my crazy family, and I was writing to remember more stories to tell him while we went through treatment. He is well now, and I keep writing. The particular story that is told in my pilot is a consolidation of events that took place over a summer where my life was forever changed by information about my family and myself. As primarily a theater person, director and writer, writing for film was new to me but it was clear to me that this story was not meant for the stage but for the screen. Writing and directing for the screen has now become a passion. And writing something so close to reality–and so close to the heart–did you try and depict events as they happened for the sake of chronicling the truth, or did you need to take liberties to make it more “cinematic,” in a sense? The only liberties I took were in the condensing of events. Everything in the film happened and the conversations are exactly as I remember them. I have written a memoir called Nobody Ever Dies When I’m Around, a lifetime of feeling left out, and I note in the preface that these are all my memories and my opinions. I don’t doubt that others who were there may have interpreted things differently, as we all have our perspectives. One other thing that changed in the film was at the end when one brother is holding the other up. The actor playing the brother who actually held my other brother up was too close in physical size to be able to hold him, so at the last moment we switched to the actor playing the oldest brother. My brother Tim, who was the real Tommy, has not let me forget that inaccuracy. The cast of The Parker Tribe is so remarkably well-matched that it feels as though we’re watching a documentary. Such incredible young talent, paired with veteran actors. Tell us about the casting process, how it all came together. One of my jobs is that I work at The New England Youth Theatre. I teach improv and acting, and direct and write shows for young actors. I knew all of the child actors as former students. Casting was a fun and serendipitous process. I had made a Facebook friend and noticed in the background of a picture she posted that the fella looked just like David Koechner. David was the only actor I felt could capture the wacky and loving nature of my father. I mentioned to this friend that the guy in the photo looked like David, and she said that it was David. In fact, it was her husband. I told her about my project and script, and she said she would be happy to pass it along. David called the next day and said he would be happy to play the father. I immediately called Tina Fey, who is a friend and former student, and asked her who could play the mother opposite David and she said “Paula Pell.” I looked her up and asked Tina to get her the script. Paula then signed on and everything fell into place. The kids were easy to cast as I had known them all since they were very young. The young lady that plays Jo auditioned twice. The first time she was very girly and it just didn’t fit. The next week she auditioned again and was totally “Jo.” The film would be such a lesser work without her. I expect she will be a big force pretty soon. Your background working with actors: does that help shape what you write, what kinds of projects you like to take on? Casting can be tricky. Is there a secret to creating chemistry as a director, or is it all about finding the right people for the right roles and everything clicks? I love directing actors, and young actors are a real joy. I think I shape what I write in knowing there are child actors who can relay what I am hoping to create. For me, I watch how people interact in auditions and rarely only see one person audition at a time. It isn’t that they have to have chemistry with everyone right away, but you can see the potential in how they engage other actors and if they are kind to one another. All of the kids I cast were helping each other during the auditions, and that told me a lot. What were some of the predominant, positive moments in your career that have led you to where you are now? The stumbling blocks? The thing that has always made me feel successful, even if I was not, was always knowing that someone thought I was the bomb. That person for me was my dad. That gave me perhaps too much confidence that I was the funniest, best person for whatever it was I was trying to do. The biggest stumbling block for me has been anxiety. When I was 19, I was at college and sorta right in-between mourning my brother David and anticipating and worrying about my brother Patrick. I was also truly accepting that I was not at all straight. I worried about what that would do to my Irish Catholic family. Spoiler Alert: it did not go well. I think due to all this stress, I began having panic attacks that pushed me off the stage for twenty years. Nobody knew what panic attacks were, and I was ashamed and embarrassed to admit that I was suffering in this way. I had kept that as something I only told very few people until the last couple years when circumstances arose which forced me to publicly talk about it. Being open about my anxiety has been very freeing, and it’s made people connect with me when they previously might have thought we had nothing in common. What was it for you that you wanted to establish in your directorial debut? Did it come naturally, or was it the end result of years of working in entertainment? I have directed theater for what feels like forever, and my goal is always the same no matter what I am directing, theater or film. The question is what do I want the audience to feel and how can I accomplish that. What I hoped to establish in my film debut was that I have a voice, something to say that I care very much about and a unique way of saying it. Many filmmakers aren’t looking to become multi-millionaires (though most are probably open to the idea. . . .). What is it that drives you toward visual storytelling? Is there something about filmmaking that’s more rewarding than, say, writing a book, or a play? I don’t need to be a multi-millionaire. I only need one million dollars. I have become more and more drawn to film as a way of telling my stories, and one thing that I like over theater is the permanence of it. Theater is awesome and quite a different experience, but when it’s over, it’s over. Film allows you to do more that a book, showing not telling. It’s the form I want to see The Parker Tribe series in. Not a book series, not a play. The biggest issue is probably the hardest: be picky. Don’t take the first producer that shows some interest, find out if it’s a good match for your style. Get references. If you find someone you think you want to work with, look them up on IMDB. Contact the people they have worked with before. Ask how the process went, most will talk to you. And if they won’t talk about a particular person or company, that should tell you something. Same with your key crew members, although I was very lucky in that I absolutely loved every member of my film crew. Also, never forget, as Michelle Lawler, my incredible DP said, “Film is a very collaborative process.” You need to lead the project, but you need to allow for people’s ideas to be heard. I would not have the film I have if I always thought my idea was best. Lawler took some of the most beautiful shots as a result of telling me her “better idea.” It was better! 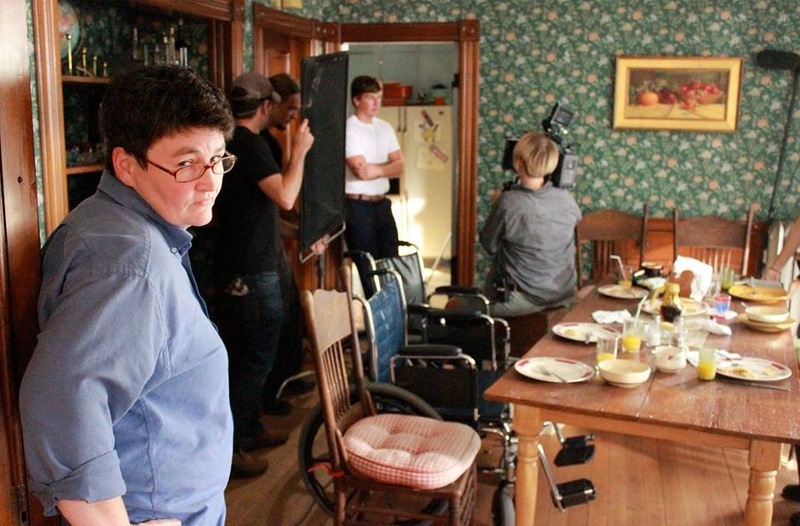 For the emerging directors and writer/directors, the first step of course is to make a short. Get something made that defines who they are and why they’re different. This is an identity business just like anything else in the arts. How does a young or new director craft a style that allows them to get noticed? I really feel that what will get you noticed is what you are passionate about. I wanted so much to make art that would be a tribute to my wacky family, and that drive brought out creative ideas on how to show what I felt. The key is to not waste time on things you really don’t care about and hone in on what matters to you. 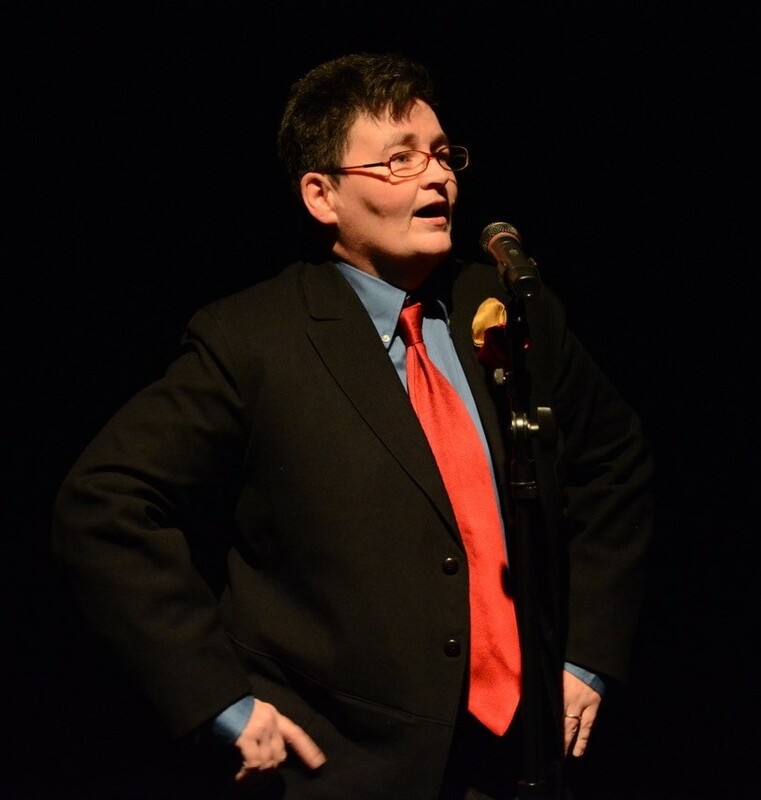 Jane Baker is a 30-year theatre dramaturge, writer, and performer. Jane has a BA in Theater from Hofstra University and a MA in Education from West Chester University of Pennsylvania. She has taught hundreds the craft of improv, acting, and writing at various institutions including Upper Darby Performing Arts Center and currently at The New England Youth Theatre in Vermont. Jane has written and published melodramas written specifically for NEYT’s Melodrama Program. She also penned her memoir Nobody Ever Dies When I’m Around. The Parker Tribe, her directorial debut,based on her childhood, premiered at the 2015 TriBeCa Film Festival. The film has won several awards including the New York Television Festival’s Best of Fest, NY Critics Award, and Best Actor (Drama) for David Koechner. She is currently working on a feature script. Jane lives in Vermont with her partner Sharon, and their objectively beautiful boys, Max and Sam.